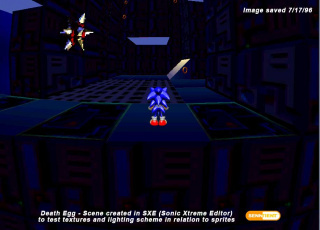 Galaxy Fortress, also known as Death Egg was a level planned for the unreleased Sonic the Hedgehog game, Sonic X-treme, taking place in outer space on the edge of Dr. Eggman's latest and greatest creation. There were intended to be at least three acts, which would have been named "Factory Robo," "Proving Grounds" and "Megabase Control." A diagram laying out how the acts would have flowed into each other. This page was last edited on 6 November 2015, at 10:23.